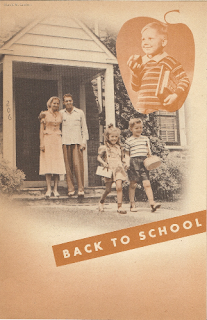 A mass-produced church program cover entitled "School 'Daze' Again" from 1953 depicts a brother and sister headed for their first day of school while their proud parents watch from the steps of their large colonial revival home. Billy in his snappy saddle shoes carries a wicker lunch basket and dutifully holds sister Susie's hand. She is equally smartly attired in her skirt, gingham-print blouse and hair ribbon. In the apple-shaped inset, Tommy smiles somewhat sheepishly as he has bitten into the apple which was perhaps intended for the teacher. The picture with its comforting emphasis on family and home presents an idyllic view not wholly accurate at the time.